We can provide all of your metal sheet and bar stock needs quickly and competitively priced. Our products include angles, round tubing, rectangular tubing, round bar, flat bar, pipe, sheets, and plate, as well as specialty items like expanded metal, tread and floor plate, ground-to-size shafts, threaded rod, and walk surfaces. We specialize in nonferrous metals like stainless steel, aluminum, and brass but can also provide carbon steel and galvanized steel products. You may purchase material either cut-to-size or in stock-lengths, and we will price it by the pound, the foot, or the unit...whichever is easiest for you, our valued customer. We deliver or you can pick it up locally at our Omaha location. The broad range of materials in our inventory is unsurpassed in the Midwest. We stock stainless steel, aluminum, carbon steel, galvanized steel, brass, and copper in many shapes, sizes, and grades. 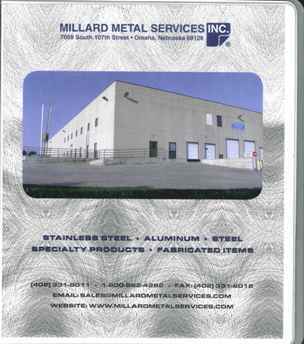 Download our Millard Metal Services Catalog (6 Mb PDF file) for more details. We are also the exclusive supplier of OptiGrip Walksurfaces. We can meet your requirements for all your industrial walksurface needs. See our OptiGrip webpage for more details. At Millard Metal Services, we pride ourselves on service. We are committed to responding to your requests for quotations promptly and delivering your merchandise quickly. Most orders are shipped complete "same day" or within 24 hours from the time they are placed. Another important component of our service is to assist with locating hard-to-find items. Over the years many of our customers have found this time-saving feature to be invaluable. We would like to thank all of our existing customers for placing your confidence in us. 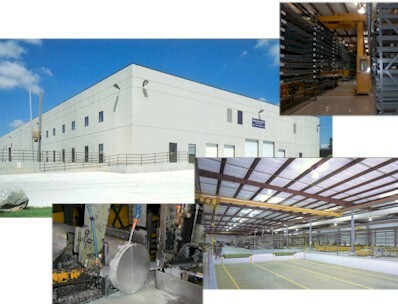 If you have not yet done business with Millard Metal Services, we invite you to contact us with your requirements. We welcome the opportunity to put our vast inventory, light fabrication expertise, and out-sourcing capabilities to work for you. Millard Metal Services, Inc., and its affiliate, Millard Manufacturing Corp. have been supplying our customers with stock size metals, fabricated metal products and other specialty items for over thirty-five years. These years of experience provide you with single call sourcing for all your metal needs. In addition, our central location in Omaha, Nebraska means fast, efficient, and affordable service anywhere within the continental United States. To provide our customers with the products and services they need that 1) meet their quality specifications, 2) meet their delivery schedule, and 3) are priced competitively. And to treat our customers and vendor partners with respect and courtesy. Copyright © 2019 Millard Metal Services, Inc.